Salina and I direct the SPIN ministry. SPIN stands for Southern Pacific Islander Network. We outreach to inner city kids in the south Bay & Long Beach area. We also lead our annual Summer Youth Camp...usually in August. We also have a worship team that ministers to young people in different churches, events and communities. On Saturday nights, we also host youth gatherings (Saturday Night Live...SNL) open to kids from all churches. At “SNL” gatherings we teach the Word of God, do games, karaoke, etc. Why are you passionate about what you do with YFC? We are passionate about this generation of young people who don’t have the opportunity to know Christ. So we create events & gatherings that they can attend that are geared toward young people so that they might build a relationship with Jesus Christ and His Body the church! We are excited to see young people grow into mature human beings who love Jesus! We want to see them grow up into young people who will independently study God’s Word and lead their friends into a lifelong relationship with Jesus Christ too! We are passionate about seeing a large number of students’ lives changed by Jesus at our Summer Camp each year. They see a large number of other young people who are passionate about Jesus Christ! This encourages them to go back to their home churches, communities & their cities and share their experiences at camp with their friends, family & youth groups. 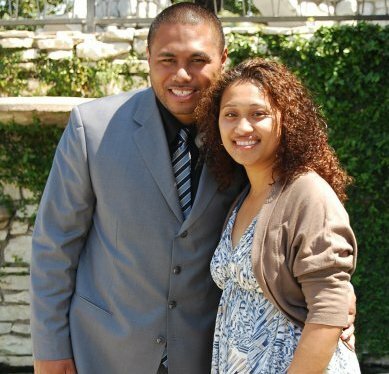 Kiano & Salina have been married for seven years with two boys, Zephaniah (age 6) and Zechariah (age 4). Our “little guys” are very athletic. They LOVE sports...like football, baseball, volleyball, soccer, basketball. You name it, they play it! They are also very good dancers. They also love to play instruments...they love to sing & lead worship like their mom! Kiano...is a staff assistant at Gardena HS, who coaches Boys Volleyball and Football. In his spare time, Kiano has been Youth Pastor at Carson Bethel Church for the past 10 years. He loves to play musical instruments, especially drums & bass guitar. Salina...is also Co-youth Pastor at Carson Bethel Church. Salina is the worship leader at the church as well. She’s a great mom and loves to sing...and really likes to cook! Also, Salina is VERY passionate about worship! Kiano loves to Karaoke in front of his own TV...late at night when everyone else is asleep. Kiano: spending time with my two sons! Our own mixture of praise & worship songs...we especially love Israel Houghton and Eddie James.